ABC’s reality robot battle show BattleBots, which first hit the air in 2000, will be returning to “BattleBox” it out again. The seventh season premiere will be aired by ABC in a 8/7 Central Time slot, starting June 23. The robot makers have already entered their bots in a pre-season competition to decide which bots would make it into the BattleBots season 2 series. From the early matches, many of the old robot weapons will be seen again this summer, such as rotating saws, swinging hammers, and flame throwers. However, the new robot weapons have also been described as “explosive” by commenters present at the event. An important consideration is that the robot targets of these weapons are metal and electronics based — other robots — rather than the targets of many other weapons being developed — people. The robot battles are not just matters of which robot has the best weapons, according to robot builders. Tactics and strategy are also important in winning a match. The battles are round-robins, so robots must be able to continue battling in future rounds to win the prize. For the upcoming season, BattleBot matches will again be 2-minutes long, followed by a review of the match with commentary by the judges, who determine the winner. In a few months, the UAE will have flying driverless cars, according to Dubai’s transport authority. They’ve already done test runs for the autonomous aerial vehicles (AAV), made by Chinese firm Ehang. The vehicles are Ehang 184s and can carry one pilot. “The AAV exhibited at the summit is not just a model; it is a real version that we have already experimented the vehicle in a flight in Dubai sky. The RTA is making every effort to start the operation of the AAV in July 2017,” said Mattar Al Tayer, the director general and chairman of the RTA. The RTA, in collaboration with the Chinese firm Ehang, has carried out the first test run of an autonomous aerial vehicle (AAV) capable of carrying a human, the Ehang 184, and the authority said it is set to launch operations very soon. The flying car was exhibited at the World Government Summit in Dubai this week and the chief of the RTA said a summer start date for flights is envisioned. The Ehang 184 is fitted with a touchscreen to the front of the passenger seat displaying a map of all destinations in the form of dots. It has preset routes and the passenger selects the intended destination. The vehicle will then start automatic operation, take off and cruise to the set destination before descending and landing in a specific spot. A ground-based centre will monitor and control the entire operation. “It is also part of the RTA’s endeavors to provide self-driving transport through engaging in the technological tests of self-driving vehicles in a Dubai environment. “It replicates Dubai Self-driving Transport Strategy aimed at transforming 25 per cent of total individual trips in Dubai into self-driving trips using various modes of transport by 2030,” added Mr Al Tayer. “The step would also enhance the integration between public transport modes and people happiness through the provision of smooth, quick and innovative mobility. “We have addressed the highest levels of security in the designing and manufacturing of the Ehang184. The vehicle is fitted with eight main propellers,” Mr Al Tayer said. Importantly, the vehicle has numerous basic systems all running independently, but at the same time, so that if something malfunctions a standby can take over. “The AAV is designed to operate under all climatic conditions unless there is a thunderstorm. The vehicle is fitted with highly accurate sensors with a very low-error threshold and can resist vibrations and extreme temperatures,” said Mr Al Tayer. “Dubai Civil Aviation Authority was a partner in our trials defining the safety criteria required, issuing the permits for trial and inspecting the vehicle, RTA appreciates their contribution. “The 4G data network is used in communication between the AAV and the ground control center. The company had also provided the support needed to ensure the continued communication between the AAV and the control centre through M2M and LTE technologies,” he explained. 3D technology comes to the rescue after the destruction of several world cultural treasures by the militant group Islamic State in Iraq and Syria (ISIS). According to the United Nations, ISIS has destroyed and damaged 200 world heritage sites along with hundreds of statues and artefacts since 2014. ISIS’ plan is simple. It is about erasing all traces of previous cultures to establish their own and take advantage of the media coverage following massing destructions of historic sites to grab the world’s attention. In addition, this cultural cleaning is a way for Daesh to finance their activities by selling to dealers and private collectors. Yet those lost treasures that some call “blood artifacts” may not be lost forever. Through her digital fabrication and 3D printing project “Material Speculation : ISIS”, Iranian artist and activist Morehshin Allahyari chose to focus on the reconstruction of selected artifacts and statues destroyed by ISIS in Iraq in 2015. In addition, to repair history and memory, each 3D printed object comprises a flash drive and a memory card. The data in these flash drives contain materials: maps, images, videos and pdf files on the destroyed artifacts and sites. They were gathered thanks to a collaboration with different archaeologists and historians, including and museum staff. Just like Murehshin Allahyari artifacts, Palmyra has suffered numerous act of vandalism. The Syrian desert city known as the Venice of the Sands lost the triumphal arch from 2,000-year-old Temple of Bel. Devastated, many archaeologists talked restoration and reconstruction such as American lawyer/archaeologist Roger Michel. 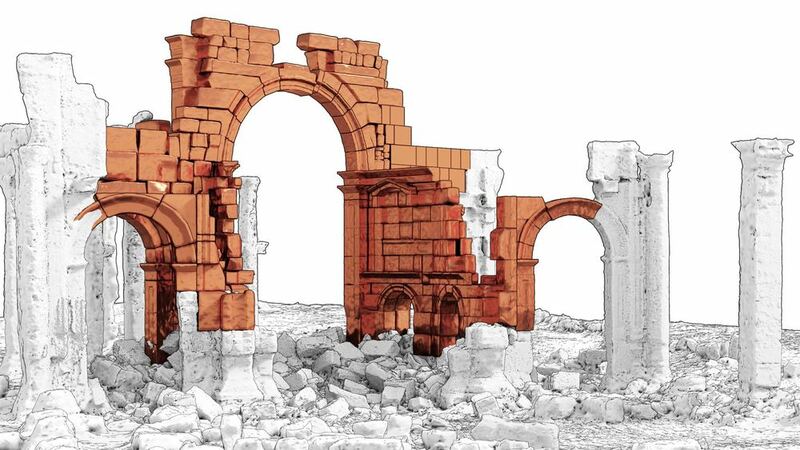 Indeed, as the founder of Oxford’s Institute for Digital Archaeology, Michel has built a 3D facsimile arch from Palmyra’s destroyed Temple of Bel. Thanks to 3D technology, Palmyra’s rose again in London’s Trafalgar Square last April to coincide with world heritage week. It should then travel on to Times Square in New York City. This 3D replica of the 15-meters arch that formed the temple’s entrance is a gesture of defiance against ISIS’ desire to erase cultural and historical evidence. Moving for some or uncanny for others, this incredible public display of 3D reconstruction is the proof that new technology can restore entire parts of 20th-century historical sites. Although out of their original context and site, 3D monuments or artifacts might still conserve their precious sense of place and craftsmanship, thus preserving everybody’s heritage. Featured image (‘Temple of Bel’): ICONEM is a young Paris based start-up focused on 3D reconstruction and analysis of endangered archaeological sites, which the group considers to be part of our common heritage. To prevent destruction caused by conflict, looting or natural disasters, they send teams on the ground to train people and help them document this heritage.